Please let us know your name so we know who to send the iPad to. Email works best. We don't need to know too much but we do need to know where to contact you. Tell us a little bit about who you want us to contact. Name, email, phone number etc. We are always grateful to receive referrals. Our goal is to work with the best talent available and we want to reward you for your efforts in helping us achieve this goal by offering you $500 towards your favourite tablet or $500 cash. 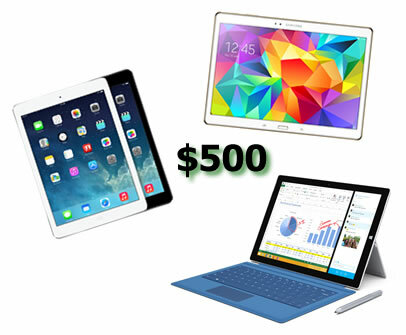 You receive $500 towards your favourite tablet or $500 cash. *THE DETAILS: For each of your candidate referrals, NAFOR Inc. will confirm that the candidate is not currently "active" in our database or has not been previously referred to us. Based on the date and time we receive the referral only the first person making the referral will be eligible for the bonus. The candidate will be contacted to confirm your details and you will be quickly updated regarding your referral status. You will receive $500 towards your favourite tablet or $500 cash after NAFOR Inc. receives full and final payment for Recruitment Services directly related to the placement of your referred candidate and if the candidate remains employed with our client for the length of their guarantee period which is commonly, 120 days. We are always grateful to receive client referrals. Our goal is to work with leading companies and we want to reward you for your efforts in helping us achieve this goal by offering you $500 towards your favourite tablet or $500 cash. Large or small, our clients are most commonly found in high change environments, where locating and recruiting the best is crucial to building and sustaining a competitive advantage. **THE DETAILS: For each of your referrals, NAFOR Inc. will confirm that the client is not currently "active" in our database or has not been previously referred to us. A new division, hiring authority or billing center with an existing client may also be eligible for the bonus. Based on the date and time we receive the referral only the first person making the referral will be eligible. The client will be contacted to confirm your details and you will be quickly updated regarding your referral status. $500 towards your favourite tablet or $500 cash will be given to you for each new Company that engages NAFOR Inc. in Recruitment Services as a direct result of your referral (offer does not apply to any other service offerings). PRIVACY STATEMENT | NOTICE | CONTACT US | © Copyright 2002-2019. NAFOR Inc. All Rights Reserved.